It’s Friday. Feeling healthy? I’m not qualified to give any dietary advice but… if you’ve been drinking wine as a healthy alternative to beer, perhaps you should reconsider. Then again, who am I to talk? That picture to the left was taken in my kitchen after a night of heavy fermentation. The result was a very tasty beer. It should be no surprise that I’ve enjoyed Beer vs. Wine Fridays. 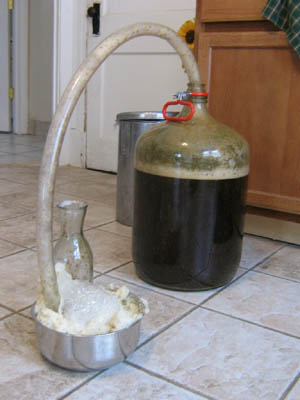 Perhaps we should let an expert take over from here — someone with a real knowledge of brewing chemistry. Alcohol is the key ingredient for countering the risk of your arteries blocking up. Guess what? It matters not one jot whether it comes from wine or beer. You might just dwell on the fact, however, that the beer contains the more vitamins, soluble fiber and silicon, which counters osteoporosis. In fact beer is second only to bananas as a source of silicon. And much more pleasurable. Wine and beer are both fabulous drinks, and the health studies are whittling away at many distinctions. It is time though for wine to descend from its pompous pedestal and for beer to hold up its head. Which, of course, it does, with those beautiful foams, one of the most pleasing sights known to humankind. If you pour the beer into a glass, that is. -Skunky flavor in beer is due to light breaking down the hop-derived materials that give beer its bitterness. -Beer and champagne both contain a lot of carbon dioxide, but stable foam survives on beer because of the bubble-stabilizing action of cereal proteins and hop bitter compounds. 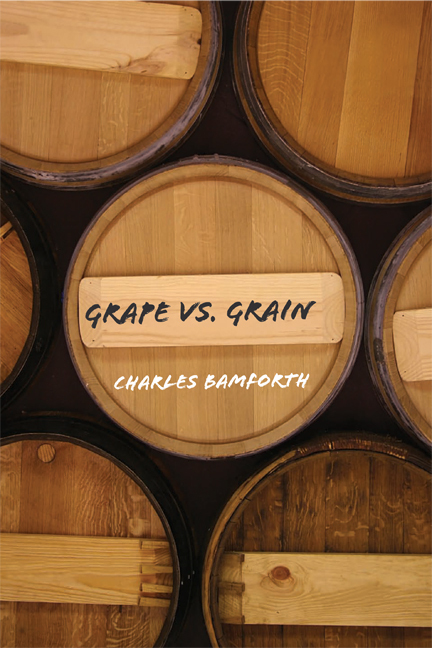 Grape vs. Grain can be found some places, and will be available nationwide May 1!